Since their invention in the early 1960s, lasers have found ever-increasing applications in medicine and dentistry. The latest generation of lasers is now being used in various dental procedures, ranging from disease detection to soft-tissue treatments, and even some hard-tissue procedures like the preparation of small cavities for fillings. One promising area where this technology is having an impact is the field of periodontal (gum) therapy. Why are more periodontists using lasers? In general, these high-tech tools seem to offer several advantages over conventional treatments for soft-tissue procedures. They are considered minimally invasive treatment methods, meaning that it's possible to perform a procedure with less removal of healthy tissue than conventional methods would require. Also, their light and heat acts to seal off blood vessels and nerve endings in the tissue under treatment, resulting in less bleeding and pain, and thus increasing patient comfort. In certain procedures, the use of lasers may offer other advantages. 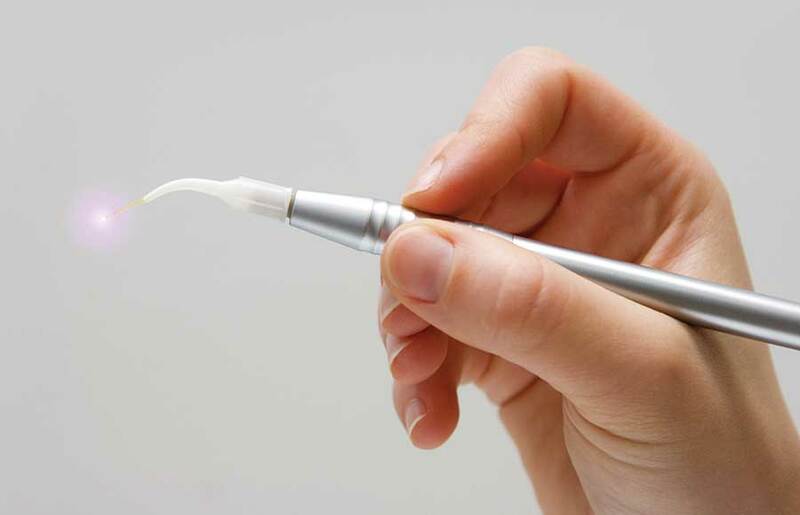 A type of laser called the Nd:YAG, for example, may be used to sterilize a periodontal pocket, where disease-causing bacteria are proliferating. These lasers can help the healing process by promoting the reattachment of bone and connective tissue. Using them may also result in minimal shrinkage of gum tissue. As laser technology and its clinical applications continue to expand, more uses will undoubtedly be found. It may seem that lasers are so common today that you can find one wherever you look — but what exactly is a laser? Its name is an acronym for Light Amplification by Stimulated Emission of Radiation. In simple terms, it's a means of generating a powerful beam of visible light (or infrared radiation) by sending pulses of energy through special materials, like certain crystals. The atoms in the material become “excited,” and produce a beam of high-energy light that is all the same wavelength, and is precisely controllable. In more and more dental offices, hygienists are being trained to use lasers for minor periodontal maintenance procedures to reduce gum inflammation. In combination with ultrasonic devices, lasers can help decontaminate the periodontal pocket and root surface. Likewise, periodontists and dental surgeons who perform more complicated procedures are finding that the new laser technology offers some real advantages to their patients. Laser procedures do not require stitches, and the risk of bacterial infection is minimized because of the sterilizing properties of the high-energy beam. Also, damage to the surrounding tissues may be significantly reduced. One of modern dentistry's goals is to increase patient comfort, minimize risk, and reduce treatment time and cost. In this respect, and in terms of becoming effective tools in the dentist's arsenal, lasers are proving themselves to be invaluable.